Courtesy listing! Please contact Patricia at 323-691-4620 or email patriciadrum@yahoo.com to inquire on Pippy. Meet Pippy! She is a 6 year old female Pit Bull who is in need of a new home. Sadly, her owner is having some troubles and can no longer care for her due to personal problems. We are trying everything possible to prevent this amazing dog from going to a shelter where she will be just another Pit Bull and no one will know what a joy she is. . Pippy has been a beloved family member since she was a puppy. 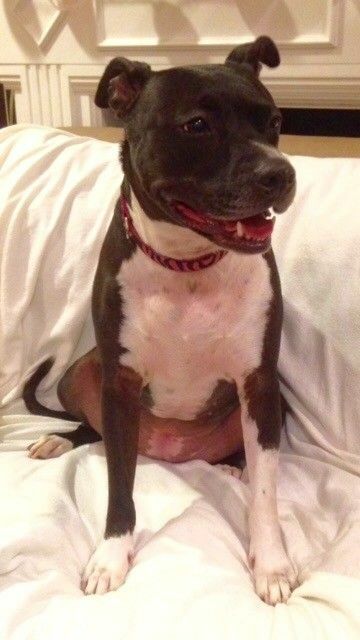 Pippy is very loving, well behaved, mellow, housebroken, great with cats, kids and big dogs. What more could you want in a dog? She also loves walks. She is an all around great example of the breed. She sleeps in a little boys bed every night. Pippi is spayed, up to date on her vaccinations and very healthy. Lots of years left to be your best friend. Please contact Patricia at 323-691-4620 or email patriciadrum@yahoo.com to inquire on Pippy.